Central American migrants traveling in a mass caravan broke through a Guatemalan border fence Friday, running into a wall of police in Mexico, whose government has promised the United States it will confront the caravan. 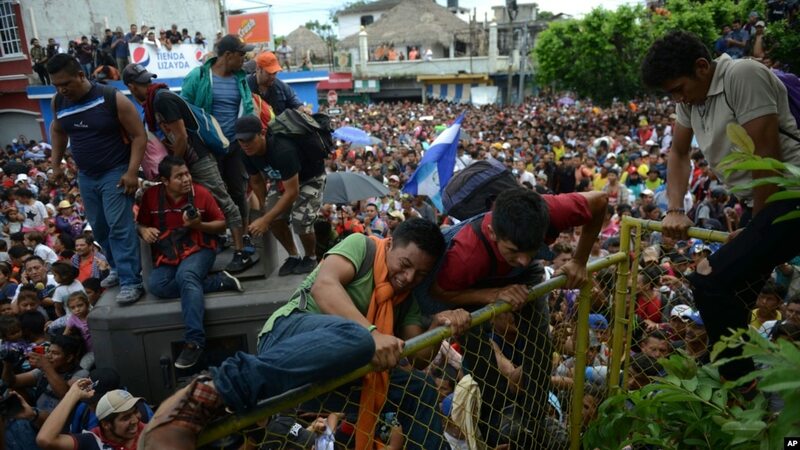 Mexican television footage showed hundreds of migrants breaking through Guatemalan border posts and streaming onto a bridge connecting Mexico and Guatemala. The migrants were met on the other side by a line of Mexican police in riot gear. Like Okies/1932 except there's a border. 4/Why did Mexican immigration to the U.S. collapse? P.S. Here's a great American heroine who doesn't get near enough credit for the increase in prosperity and power of the the U.S. in the 20th century. Birth control is fundamental to the perpetuation of the species in a humane and "Christian" way. More so than like, antibiotics. Too many children = misery, starvation, crime, death, destruction, and all kinds of cruelty due to survival of the fittest.The Chinese knew, learned from hard experience. This is Gab. A far right website. Actually... not so "far" anymore. Maybe more center right. The last thing the left wants prior to the midterms is an image dramatizing the weakness of our southern border. The images, of a throng of migrants as far as the eye can see on a Mexican highway or of migrants hanging off a truck, are compelling. To which the response of progressive commentators has been: No fair. So 5--10 thousands. Trump is kicking out 1/2 million Haitians, Africans and Central Americans who have been here up to 15 years on special visas, in addition to cutting immigration 40k or so. The birth rate in the US is plummeting. At 1/4 our population, Germany took in a million refugees from George W. Bush's Great Adventure in the Middle East. There will of course be more to come as climate change affects nations already barely making it, on the edge.Ranting about it and inciting mobs with fear ain't gonna stop people who are desperate. Lowry's message for democrats is that the democrats shouldn't act like the strawman he and other republicans have created to attack the democrats. It's just a continuation of the same old strawman argument. Virtually all democrats want to control the border. I know of no democrat that advocates for an open border. Time and time again virtually all democrats have voted to increase border spending and have compromised in the attempt to get a comprehensive immigration bill. No compromise has ever been enough for republicans because democrats want a path to citizenship for dreamers and those who have been in the country for years as part of that comprehensive immigration bill. Republicans lie and claim democrats don't care about border security. Anyone else remember Reagan's fear mongering about Sandanistas just a day's drive or so from our southern border?